Of Cheese, Bubbles and Foothills | What Goes with What? I’m in a huge hall at the Sonoma fair grounds filled with specialty cheeses as part of the California Artisan Cheese Festival and I whom do I find, well it’s Janet Fletcher, the author of several cheese matching and cheese cookbooks, and the winner of three James Beard Awards … and she still agrees to talk with me. Ms. Fletcher notes, “Most Chardonnays are round and have a soft texture so they would work well with Camembert’s and Brie”. Both are cow’s milk cheeses, though Brie has a higher fat content and creamier texture from the addition of cream. The Brie I mentioned recently from Costco is a good match with Chardonnay. Earthy components and umami flavors and the lighter tannins and delicate flavors of Pinot Noir match well with mushroomed or truffled Brie. 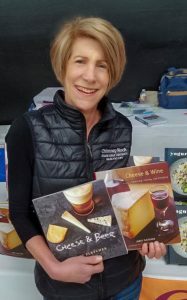 Janet says that the medium intensity and tannins of Merlot really opens up the cheese pallet to Spanish Manchego, California dry Jack, Fontina and Toma, a cow’s milk cheese. And in a different vein, get it vein, the direction for big blues, aged Spanish cheeses and a bit to my surprise, goat cheese will work with tawny and aged ports. 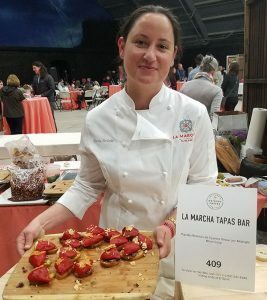 Chef Emily Sarlatte of La Marcha Bakery & Restaurant in Berkley responses a bit more emotionally regards cheese and wine matching. “Pairing is personal, I usually choose my cheese first, as it’s easy to find the right wine” she stated without pause. 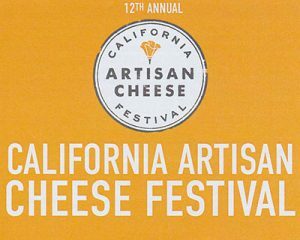 Chef Sarlatte who was offering cheese samples at the festival, suggested looking for cheese and wine from the same region and offered a rule of thumb that, “richer cheeses need richer wines”, makes sense to me. Processing produces cheese that melts like a dream and can be amazing and there are times when nothing else will do. If we’re talking about a cheeseburger or a breakfast sandwich, we’re hoping to see a perfectly melty piece of American cheese on top of that patty or egg and we love it for that. We now resume our normal programing…. Greg Graziano got off of his tractor in Potter Valley to return my call as a follow-up to our meeting at a sparkling event in Mendocino County. 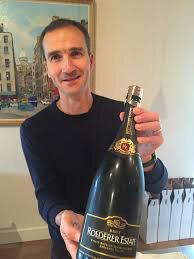 He is the proprietor of Graziano Family of Wines in Redwood Valley about 50 miles north of Santa Rosa. 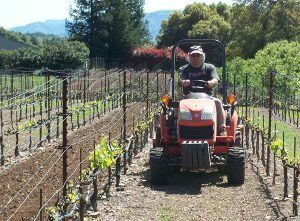 Greg is a hands-on farmer, winemaker, traveling salesman, wine blender, and deliveryman. He works with his daughter and an assistant winemaker but claims he’s in charge and his word goes, I bet. He is quite proud of his wines and metaphorically thumbs his nose just a tad at the folks from Anderson Valley who are situated on the Mendocino coast and is most rightly well-known for the Roederer sparkling wines; they were pouring in Magnum at the tasting, very nice. “It’s important to have consistency” Greg pointed out, “so that you get good acid, low pH, good tannins and to be well structured for 2 to 3 years of aging. We use a lot of different clones because more diversity makes for better blends”. While on our way to Sacramento for the Zinfandel tasting – the things I do for you loyal readers – we just had to stop in Sonoma for a brunch and bubbles tasting – part of an upscale Signature Sonoma Valley wine and food event – the brunch was the only part we could afford. We really loved the Blanc de Noir and vintage sparkler from Gloria Ferrer Caves & Vineyards as well as the sparkler from Schug Carneros Estate Winery. I loved the deviled eggs and they were tasty with the wines. “Deviled eggs are one of my favorite things to make” explained Ramekins Catering Executive Chef Kyle Kuklewski. “We mixed a little nettle (tastes like spinach, but with a stronger flavor) pesto with the traditional (egg) mix, topped it with pickled mustard seeds and a crispy bacon chip”, who at the church social would have thought. The Sierra Foothills are a good hour east of Sacramento and includes eight counties that stretch 120 miles roughly north to south and are set 80 miles inland from San Francisco. The preponderance of top wines are from Amador, Calaveras and El Dorado counties. Amador County seems to be the best known of the group, their grape-growing and winemaking history goes back to the mid-1800s, Gold Rush days. There are 46 wineries in Amador and another 157 located throughout region. 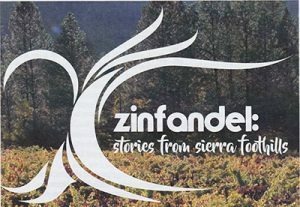 We’ve been there – about ten years ago but this trip was easier as the folks from ZAP (Zinfandel Advocates & Producers) www.zinfandel.org were good enough to bring a nice representation of 22 wineries into town that made sampling a lot easier. A complex jumble of exposures allows producers to choose between warmer, western-facing locations for heat-loving Zinfandel and cooler angles for Chardonnay or Merlot. As the climate runs mostly warm to hot, there’s little or no Pinot Noir, Pinot Gris or Riesling. Most of these wineries are small producers and most of their sales are out the front door but if you look hard enough and ask a bit at your local wine shop you may find some terrific Zinfandel and blended wines at great value from Amador Cellars, Easton Wines, Renwood Winery, Turley and Lava Cap Winery. Wow, I’m tired after all of that but happy to do it all again. I even have a great new recipe for you from Ian Garten and matched with a Scotto Lodi Chardonnay, one of the best matches I’ve ever made – love it when a plan comes together. That’s my whine and…I could be wrong.